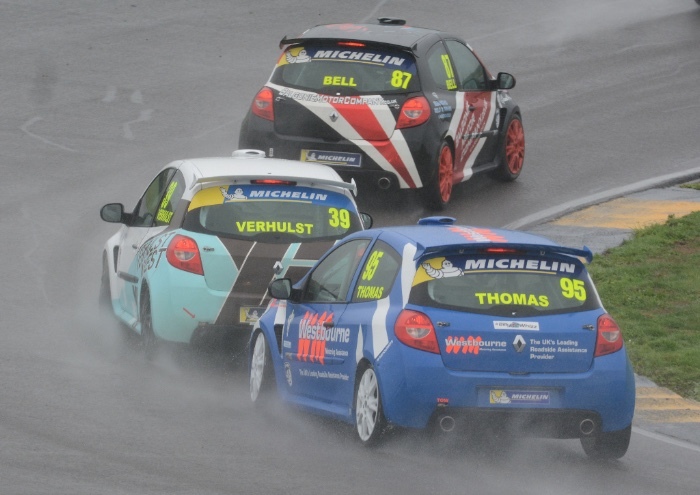 Ben Colburn led Westbourne Motorsport’s charge with a hat-trick of podium finishes as the Michelin Clio Cup Series returned to action at a rain-affected Anglesey Circuit last weekend [01-02 September]. The Renault UK Clio Cup graduate held off a charging Simon Freeman behind to earn a fifth visit to the rostrum of 2018 in the opening contest – and led the second for around a third of the race before eventually being re-passed by defending Champion Ben Palmer. Colburn was forced to settle for the runner-up spot, and cemented his form in North Wales by repeating the feat in the final race later in the afternoon to throw himself into contention for second overall in the standings heading to the finale at Silverstone in early October. Team mate Ronan Pearson held that enviable position heading into the weekend – and would have broken the lap record for the 2.0 litre, third generation Clio Cup machine on the Coastal circuit, if not for Palmer edging him out of pole position by a mere 0.067 seconds – but that proved to be the highlight on a difficult weekend for the Scottish racer. Accident damage put him out of contention in the opener and necessitated an overnight repair job for the Westbourne mechanics, and though he bounced back to score solid points in fourth the following morning, a failure on the front-right driveshaft ended his weekend in frustrating fashion. Sean Thomas took a season-best result of fourth away from the weekend as he continues to develop following a graduation from the Road Series, and backed it up with another top eight the following day before a retirement in the finale ended his weekend. Nevertheless, he has signalled his intention to compete for podiums heading to the ‘Home of British Motorsport’ in a month. Vantage Motor Group-backed racer Finlay Robinson continued his forward progress towards the sharp end of the field, as did team mate Tony Verhulst and the returning Sarah Franklin as the trio brought home a trio of points finishes apiece. Paul Bell was also on a forward trajectory, starting the weekend with a brace of eighth place finishes before taking home his season-best result of fifth in the final contest. Darren Geeraerts was absent from the Road Series, but Richard Guy’s hard work paid off and he came oh-so-close to a maiden podium in the hotly-contested category for race-converted Renaultsport Clio 200s. It remains all to play for as the clock ticks towards the finale, at Silverstone, on 06-07 October. Tagged Michelin Clio Cup Series. Bookmark the permalink.